Group Of People Are Trying To Shake Opponents Off A Bridge In This Interesting Game. There are many games that are played for entertainment but some of them are more enjoyable. We can get more pleasure if we play together by taking part in a group. 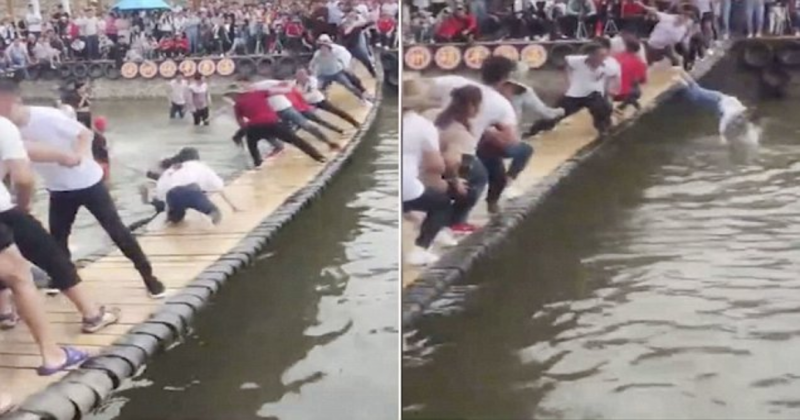 It is such a game that takes place on a wobbly bridge in central China has shot to fame as a hot spot for visitors to put their balance and body coordination to the extreme test. We know the people of China creates some bizarre game that are more interesting and also enjoyable. This game is played when some tourists gather in a tourist spot that is Shuoping Flower Field, in Ruzhou city features a swinging bamboo bridge built just above a shallow pond. The rule of the game is really interesting. Fearless visitors are invited to form teams and try to shake their opponents off the wobbly bridge and into the water. You can see some visitors are swing the flexible hanging bridge to fell others in the water. The challenge has become a massive hit on Chinese social media recently, with millions of net users sharing their desperate yet hilarious – attempts of staying dry.